Are you looking for a private label Wetting Agent manufacturer? Look no further because we have over thirty-four years of expertise formulating innovative solutions for successful companies just like yours, all around the globe! AmegA Sciences exclusively deals with B2B private labelling (we are unique because we don’t sell direct to consumers under any circumstances), and we are able to formulate, package and distribute market-ready products for the turf, ornamental, agricultural, and horticultural markets. Our clients save time and money when we handle their manufacturing needs, as we automate all processes, so they can focus entirely on their business and marketing efforts. Offer world class wetting agents to your customers today! Wetting agents (otherwise known as soil surfactants), are an exponentially growing business venture and this trend is continuing in 2019. For example, golf courses, sports fields and hotels all use soil surfactants because any % reduction in water requirements result in a proportional % of money saved for that organisation. 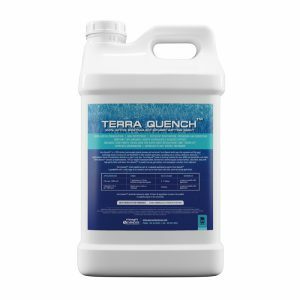 We’re talking about extremely large savings here so it’s easy for companies to justify making bulk orders for wetting agents as it quantitively improves their bottom line; whilst also helping to reduce stress on already-strained municipal water systems (especially in times of drought). We haven’t even mentioned wetting agent use on consumer lawns, or other ornamental turf installations, which thousands of SKUs are sold every single day for. We’ve got the capabilities to supply your company with some of the best wetting agents in the world, and we have university-tested data to back our claims. Keep reading and we’ll cover everything you need to get started. How do wetting agents work? Before you sell anything, you need to do your research on the items you’ll be selling. Here’s some facts (verified by R&D and backed by academic studies) which you can use for descriptions and marketing purposes. Alternatively, if you already have a solid understanding of wetting agents and you want to jump straight to business, click here. Water repellency (soil hydrophobicity) naturally occurs in soil and increases overtime. This is due to the build-up of hydrophobic coatings on soil particles and can also be caused by changes in soil charge, or soil particle orientation. This is particularly observed with sandy soils. Soil hydrophobicity can severely impact turf or plant health (otherwise known as plant stress) because it starves root systems of water. Decreased soil penetration and drainage rates mean water can sit on the soil surface, resulting in waterlogged crops and fields. In many of these cases, a large portion of the applied water will sit on the surface until it evaporates which is an inefficient waste. Soil hydrophobicity can occur inconsistently, resulting in small pockets of stressed and dead plants or turf (called localized dry spots, or LDS). Our 8oz wetting agent tablets are designed specifically for spot treatments and are often purchased to treat LDS. They’re also used in several nurseries so wetting agents are dynamic in their use-cases! Wetting agents work by dramatically reducing surface tension allowing water to better penetrate soil and be made available to the root system (root zone), which assists plant growth to a measurable degree. They also significantly increase watering efficiency and decrease the amount of water needed to maintain plant or turf health. Many parts of the US have experienced recent droughts so mandatory water restrictions are often issued; wetting agents can help mitigate the effects of these water restrictions! 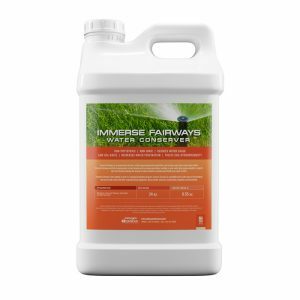 What makes AmegA Sciences’ wetting agents unique? All of our wetting agents and soil surfactants are 100% non-phytotoxic. That means they don’t have any harmful plant or turf side effects which have been found in other solutions currently on the market. They use a proprietary technology that increases water penetration, wetting and rewetting. (Allowing water to penetrate the soil profile and spread to the root system once under the surface, ensuring more even distribution). In addition to proprietary, highly-efficacious, non-phytotoxic, non-toxic, base-wetting agent technology, AmegA sciences has leveraged a host of technologies ranging from biostimulants, Humic, Fulvic and amino acids to further improve performance and increase plant health. We love finding elegant solutions to complex soil and plant growth problems! Do you want to offer premium wetting agents to your customers? When you work with us, you’ll gain access to our extensive wetting agent catalogue as a starting point. Browse through these products so you can find the most relevant solutions for your business. 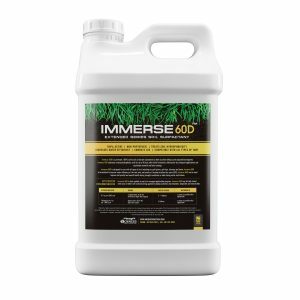 When you have a couple formulas in mind, such as Immerse 60D™ Extended Series Soil Surfactant (launched January 2019), we can proceed straight to a private label rollout or alternatively, you’ll be able to start customizing their formulas if you so wish. Most of the trademarked AmegA formulas you pick can be altered and customized at a chemical level for your specific needs. Simply contact us and we’ll put you in touch with our passionate lab experts who would love to help you flesh out your product’s unique selling points and functional benefits. Once the wetting agents are ready, we can bottle them up for you with our world class state of the art packaging capabilities, which include a plethora of different bottle sizes and container types ranging from tiny 4oz bottles all the way to 275-gallon totes. Interested in offering size variations? Our recently overhauled bespoke analytical-inventory-system makes bottling and fulfilling massive orders a stress-free and highly efficient process. When your products are contained, you’ll want them to stand out on the shelf or e-commerce marketplace! Due to a myriad of new regulations regarding label design and production, our clients asked that we take a larger role in both the design and end-to-end production of the labelling process to ensure compliance. We listened and invested heavily in skilled creative personnel and powerful equipment so as to provide the highest quality labels possible. This is reflected in the final product, which is market-ready, compliant and attractive for your customers. We also offer in-house design services as a courtesy which include booklet creation, flyer production, banners and posters! We can handle every aspect of shipping and logistics for your wetting agent orders. Small parcels can be drop shipped via Fedex, while our extensive network of trucking contacts can be leveraged for larger orders. Even international shipments are supported, and AmegA Sciences can facilitate the creation of all required import/export documentation. Get premium wetting agents and soil surfactants for your business now!